 It’s a #mootsmonday and we’ve got a bit of insight into this past weekends races. 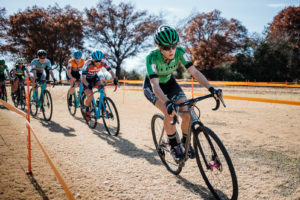 With nationals only two weeks away the ALPHA BICYCLE CO GROOVE SUBARU CYCLING TEAM is stoking the coals to a red hot glow. 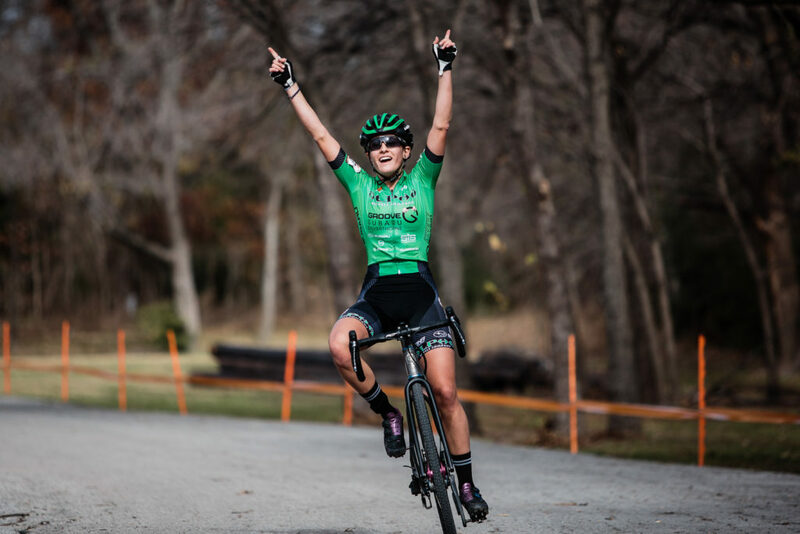 Team manager Adam Ruchubinski writes in about an exciting win by Katie Clouse, who nabbed her first UCI Elite win….at age 17. Katie leads out the field in the Texas sunshine and dormant grass. 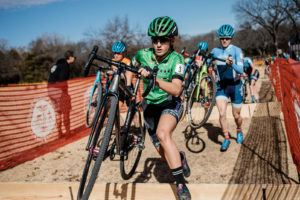 Sunny skies, wispy clouds and 60 degree temperatures graced the venue of Resolution Cross outside Dallas, TX on Sunday morning. The perfect compliment to what can only be described as a loose atmosphere around the team’s race day compound. With an untraditional schedule of a mid day race start, some of the normalcy and routine was lost. After declaring after her first pre ride lap that “the course just isn’t for me”, Katie’s feelings seemed comforted by the previous days silver medal. But she wasn’t content. Katie runs those stairs every lap except the last! As the team headed out for a couple preview laps, I stayed back and had to do an emergency shifter replacement on Gage’s bike. It added a bit of anxiousness mainly due to the amended timeline. There’s only one chance to make sure it’s absolutely perfect. But it also meant I couldn’t be in full attention as to the rider’s actual pre ride and what would prove to be decisive sections. As I immersed myself in the job at hand, Katie returned and said “I rode the stairs!”. I kinda blew it off and made some off the cuff comment. Little did anyone know just how confident she was in that maneuver. 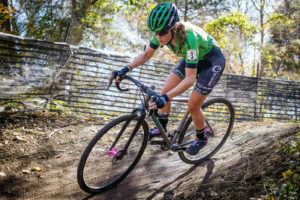 Through the woods, Katie proves herself as the future of the sport every weekend. On the first couple of laps, Katie dictated the race. Going to the front and driving the early selection to include the previous days podium. A bit of confirmation was all that could be offered from the pits. She was going to have to figure this one out on her own if she was going to best Saturday’s result. Something was just different. You could see it in her expression. She was systematically breaking down the pieces of the race as it happened. She was smooth and fast, just like Katie always is. But, just how and where to apply it. Ealry in the race over the planks leading the field. Sitting in the middle of the podium group as the bell rung, Katie passed directly in front of the tent as her teammates warmed up. Just then Brannan yelled “DO IT THIS LAP!” Smooth and fluid as she drove the bike through the trees and past pit one. 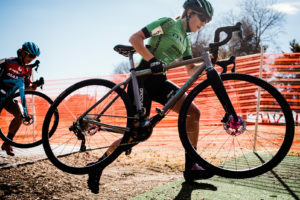 Then, her signature acceleration up the only real climb on the course and by the time she was over the barriers only previous day’s winner Courtenay McFadden was left. Katie’s effort had earned her three to four bike lengths, but the race was far from over. There were just too many places on the circuit where a chaser could simply roll up to the wheel in front of them. As she ripped through a final grassy descent back in to view, she then turned to head back out of sight seemingly throwing the whole theoretical book of matches on the fire at once with another sharp acceleration and the execution of riding those stairs just as she had perfected in pre ride. As she disappeared in to the heavy wooded section, my heart rate rose probably 20 beats per minute. She just had to keep the wheels on it. Katie emerged with a 5 second gap and after one last “stay smooth Katie Clouse” as she passed by the pits the last time, the eyes started to well up. She would do it, she EARNED this win. It’s a lot of work and the feelings come out at the finish. The look of elation, relief and gratitude from as I ran to the finish line was something that I won’t soon forget. That embrace that is shared after each rider gets that first UCI victory is indescribable. It’s something that lasts a lifetime. 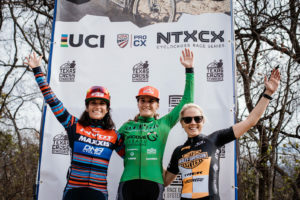 For Katie, it’s not only proving to herself that she belongs on the top step no matter who shows up, but knowing that it’s another item on a long list of firsts for her. She’s accomplished something at such a young age that few have done before her. The more important thing to remember is that this is just another stepping stone towards what is bound to be bigger achievements. The work never stops. As we all decompress, I think about all of our partners that believe in this journey. I want to shake hands, look you in the eyes and say Thank You. None of this would be possible with out you.